Edimax BR-6478AC routers include a very basic firewall that helps protect your home network form unwanted access from the internet. Since this firewall blocks incoming connections you may need open a port through it for certain games and applications. This process of opening a port is frequently called a port forward, since you are forwarding a port from the internet to your home network. Setup a static IP address on either your computer or device that you want to forward a port to. Login to your Edimax BR-6478AC router. Navigate to the port forwarding section. Click the Port Forwarding or the Virtual Server button to forward ports. Create a port forward entry. While these steps might seem difficult at first, we will walk you through each step for your Edimax BR-6478AC router. We think that forwarding a port should be easy. That's why we created Network Utilities. Our software does everything that you need to forward a port. When you use Network Utilities you get your port forwarded right now! It is important to setup a static ip address in the device that you are forwarding a port to. This ensures that your ports will remain open even after your device reboots. Recommended - Our free program will setup a static IP address for you. → Download Network Utilities today! Or follow our Static IP Address guides to setup a static IP address. After setting up a static ip address on your devices you need to login to your router. Now we are going to login to your Edimax BR-6478AC router. Your router has a web interface, so you will login to it using your web browser. This can be either Chrome, Firefox, Internet Explorer, or Edge. It usually does not matter which browser you choose to use. In the picture above the address bar has 192.168.2.1 in it. Just replace all of that with the IP address of your Edimax BR-6478AC router. Your router's IP address can also be refered to as your computer's default gateway. You should see a box prompting you for your username and password. Enter your username and password, and then click the Login button to log in to your Edimax BR-6478AC router. If your username and password do not work then please visit our Default Edimax Router Passwords page. If you still can't login to your router because you forgot your Edimax BR-6478AC router username and password, use our How to Reset a Router Password guide to set your Edimax BR-6478AC router back to its factory settings. Click the Advance link near the left of the page. This router has two different sections that allow you to forward ports. One section allows you to forward a range of ports, and the other allows you to forward a single port. 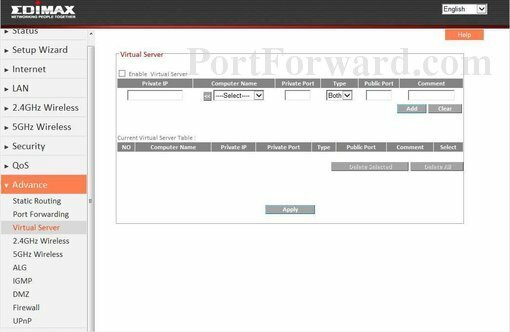 To forward a range of ports, click Port Forwarding. To forward a single port, click Virtual Server. Verify that you have the Enable Port Forwarding checkbox checked. 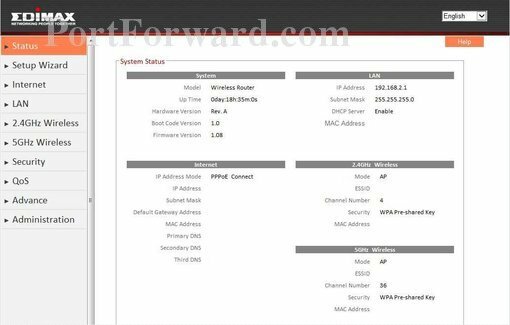 Enter the IP address to forward these ports to into the Private IP box. If you are forwarding ports so you can run a program on a device other than your computer then you can enter your device's IP address into that box. In the Type box select the protocol that you want to forward these ports over. 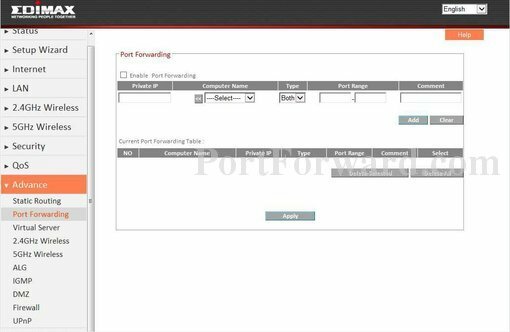 If you are forwarding a range of ports then you need to enter the lowest number into the left Port Range box and the highest number into the right Port Range box. If you are only forwarding a single port then you can enter that same port number into both the left Port Range and the right Port Range boxes. Make up a name to put in the Comment box. The name does not have any effect on the functionality of the forward, it's simply there so you can know why it was created. When you are done click the Add button. Enable the Enable Virtual Server checkbox by putting a check in it. 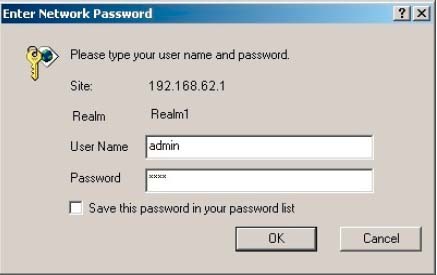 Enter the IP address that you want to forward these ports to into the Private IP box. Note that if you are forwarding ports so you can run a program on a device other than your computer then you can enter your device's IP address into that box instead. Enter the same port number to be forwarded into both the Private Port and the Public Port boxes. Enter the name of the program into the Comment box. It doesn't really matter what you put into this box, but something that will remind you why these ports are being forwarded is be a good idea. When you are all done click the Add button. Your ports should now be open. It is time to test them. Now that you have forwarded ports on the Edimax BR-6478AC you should test to see if your ports are forwarded correctly. To test if your port has been properly forwarded, you can use our Network Utilities tool, which includes a free Open Port Checker. Our Open Port Check tool is the only online port checking tool with Guaranteed Results. We also have the Internets largest collection of Router Screenshots.